Roger received this photograph from a lady who is seeking information on both the engine and the location of the photo. The loco seems to be a North London Railway Class '75' 0-6-0 Tank. Can anyone confirm and add any further information please? This would appear to be NLR no. 65, one of the thirty '75' Class of 0-6-0Ts designed by J.C. Park. They were originally numbered 15�18, 61�66, 75�80, 91�95, 104, 107, 111, 115�116, 119, and 121�123. In 1909 the nine locomotives numbered above 100 were transferred to the LNWR and renumbered in the 2600s. The remaining locomotives were also transferred in 1923 (to the strictly defunct LNWR) and renumbered in the 2800s. All became LMSR stock at the grouping, and were renumbered 7503�7532. The first withdrawal took place in 1930, and in 1934 the surviving engines were renumbered by adding 20000 to their numbers. In 1948 the 14 surviving engines passed to British Railways and were renumbered 58850�58863. The last survivor (55850) was withdrawn in 1960, and is preserved (undergoing restoration) at the Bluebell Railway. No. 65 was transferred to the LNWR as 2883 in 1923, and probably carried this number for a year or so until again being renumbered 7513 in the general LMS scheme. For more information see Locomotives Illustrated no. 129 � 'The North London Railway Tank Locomotives'. I have no idea of the location � but would guess Devons Road. My first thought is the location was the approach to the goods warehouses at Broad Street. The tall chimney appears in a fairly well known view of the approach to Broad Street passenger station taken looking north. 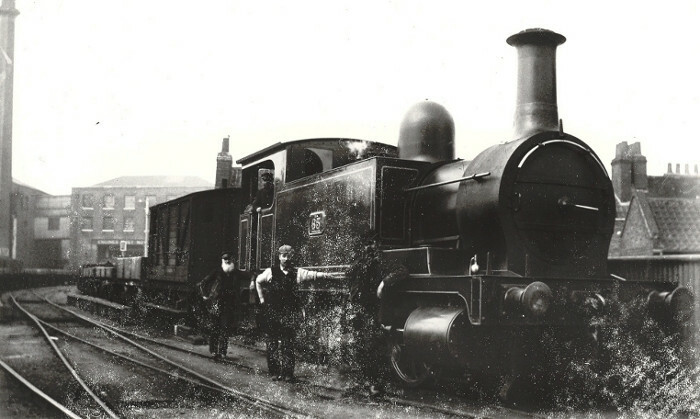 The photograph was in the Locomotive Publishing Company collection and shows an LNWR Broad Street to Watford Junction Carriage Set, NLR 4-4-0T and LNWR 4ft 6in 2-4-2T. The latter was waiting to depart with an Outer Circle Train, to either Mansion House or Earl's Court depending on date, via the Hampstead Junction line. The goods warehouses are out of shot in this photograph, but the chimney is very prominent towards the left side of the LPC photo, which fits as the mystery photograph is taken looking south. The North London Railway '75' Class consisted of thirty 0-6-0 tank engines designed by Mr Park for goods and shunting work. They were introduced in 1879 commencing with no.75, the class was built at Bow and was completed in December 1881. The locomotive in the photograph appears to be no. 85. They were very successful and in later years some were transferred to work on the Cromford and High Peak line in Derbyshire. The last example was withdrawn by British Railways in September 1960 as no. 58850 (ex-NLR no. 116) and is preserved. It can be seen today on the Bluebell Railway in Sussex. Source: The North London Railway by Michael Robbins, The Oakwood Press. I believe that the photograph may have been taken at Haydon Square, LNWR Goods station, Aldgate, London, looking north, about 1900 to 1910. The chimney on the left tallies with a similar square chimney on the 1:2500 Ordnance Survey plan of 1913. I do not think that this photograph was taken at Broad Street or Commercial Road goods stations because the layout is different. NLR no. 65 ended up as BR no. 58854, withdrawn in December 1956. As to location I have found nothing of help in my 'archive', but I would suggest the Millwall/Blackwall/Poplar area - the wagons being shunted(?) look more likely to be in docklands than in the vicinity of Broad Street. There was a suggestion that the wagons seen were more likely to be at a docks. They are in fact all of LNWR origin. The 10-ton brake van is LNWR D16, the 2-plank open to D2 and the two single planks to D1. These were all amongst the most common LNWR wagons and as such it could be anywhere, but I wouldn't rule out an LNWR location like Broad Street or Hayden Square. Further to my post of February 20th on the above photograph, Jim Connor, who is an authority and author of books on the North London Railway, has confirmed to me that he has identified the location as Haydon Square goods depot. Carol Clarke, the lady who sought information on this photo of her grandfather's engine, has conveyed her thanks to everyone who contributed. She is most impressed with the response. Her Grandfather is the driver with the splendid set of whiskers.